It was great to take part in the latest Blue Prism Café with over 500 live attendees, where we discussed our automation journey with a live audience – and this blog encapsulates those insights and final thoughts from that conversation. As the largest manufacturing company in Europe, innovation has always been at the heart of Siemens – and we continue to innovate in a start-up style – embracing technologies such as Robotic Process Automation (RPA) as part of our digital transformation journey. Our efforts have been well recognized – Everest Group ranked us as a pinnacle enterprise in RPA adoptionand we were among the winners of the CIO 100 Awards 2018 too. In this blog, we’ll highlight how our global RPA service, run jointly by the Shared Services and IT department, has enabled the lines of business in realizing true efficiency and quality gains – along end-to-end processes. 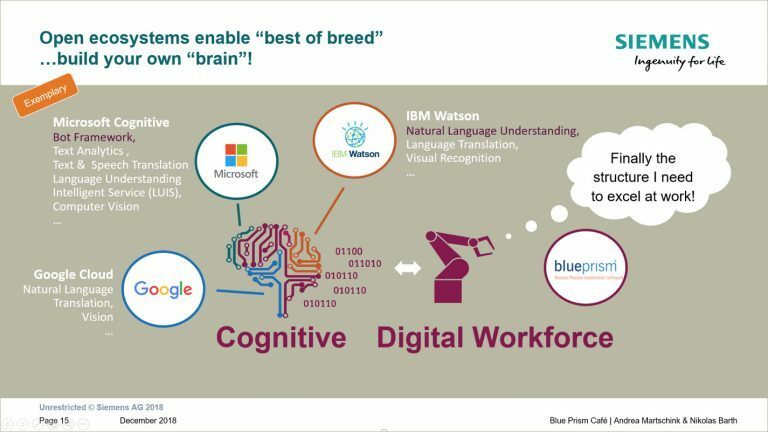 We’ll also provide insight into how we’re leveraging some of the latest intelligent automation technologies – such as; IBM Watson, and Microsoft Azure chatbot technology – with Blue Prism’s RPA technology – to equip our Digital Workforce of software robots with cognitive capabilities. We launched our “professional RPA service” in October 2017, which is now available within Siemens – worldwide. We created a global center of excellence (CoE), run by a team of 50 specialists, to prioritize, align and digitalize processes on demand – via three delivery hubs in Europe, South America and India. Our CoE defines and monitors the RPA service framework and standards across all hubs – which cover activity areas such as; service delivery, quality assurance and information security. To ensure that we experience rapid results in the implementation of RPA projects and business successes, the development of in-house RPA expertise and close cooperation between IT teams and business leaders is critical. Another key success factor that we’ve recognized – to maintain speed and agility in RPA delivery – is ensuring that our project core teams remain small, focused and consist of high-quality individuals. One of our main hurdles moving forward was how to address the challenge of automating an entire business processes chain – especially ones that contain media breaks and unstructured data across the back – to – front end. To address this, we understood that our Digital Workforce of software robots had to evolve. We therefore created an open ecosystem to enable “best of breed”intelligent automation technologies to be augmented by our Digital Workforce. 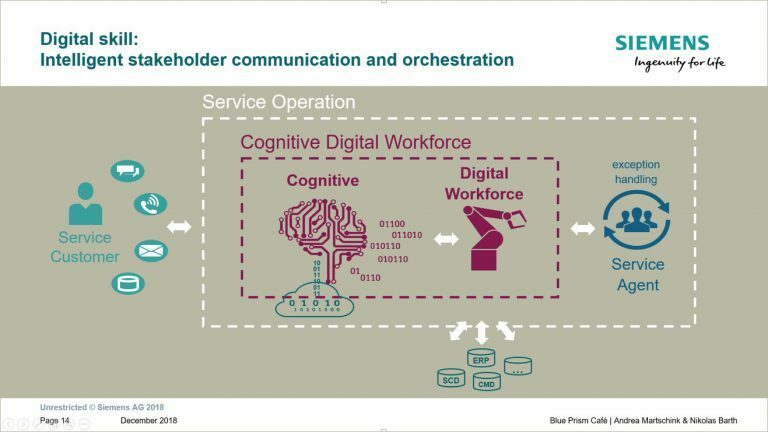 Adding these cognitive layers is important when handling customer service scenarios – where Digital Workers can now deliver the first level of support – while generating handling exceptions for humans – who provide answers to more complex questions or requests. A good example of end-to-end, process automation is for managing invoice payment queries for both internal stakeholders and external suppliers. We use an integrated chatbot to automate and orchestrate invoice status related inquiries using real-time ERP and workflow data.Our cognitive Digital Workforce interprets intent, collects the required information, retrieves real-time status from back-end systems, sends a response to the users and if not resolved, creates a ticket – which is passed to a human service agent. This automation is resulting in reduced manual effort, 24/7 availability and faster response times. Blue Prism is our partner – as we deemed their RPA platform is an excellent and scalable product for our enterprise operating environment. Initially, we had 50 processes and 80,000 working hours automated and after completing our learning phase, we’ve scaled up our activities in less than a year – with additional 170 processes in production and additional over 280,000 hours automated in the last fiscal year. The main benefits we’re experiencing include cost reduction, quality improvement and faster response times. 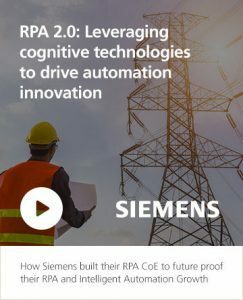 Ultimately, by applying cognitive technologies to RPA, bridges the gap between humans and IT systems – where all parties increasingly work more seamlessly together – to enable continual, digital transformation.